Victor Crowley Slaughters on Page, and You’ve Got to See it! It wasn’t but a few weeks ago I heard about a Hatchet comic floating about. 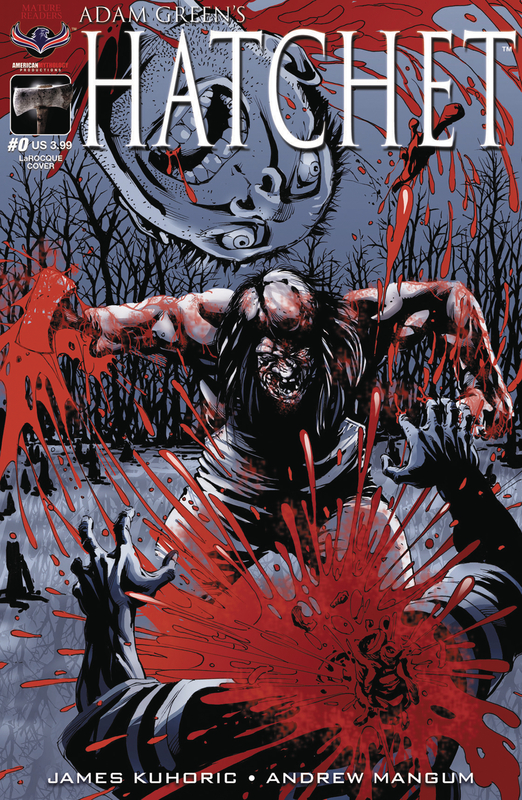 A little research and I managed to get a glimpse at Hatchet #0, from American Mythology Comics. Another week or so passes and my Box of Dread lands on my doorstep. It’s atypically light, and I can’t help but feel a little disappointment long before I get the tape split. Turns out yeah, it’s one of the lightest boxes I’ve ever gotten from Dread Central. If it weren’t for the Hatchet comic inside, I think I’d be epically disappointed. But that comic… I’ll be damned if that comic didn’t save this one from disaster and then some. The book does a good job of recounting the events of the first film while adding a few new wrinkles to the origin and history of Victory Crowley. Cooler yet? Jack Cracker is the narrator of the story. Yeah, ridiculously cool… even if a little shortsighted. If you know the first Hatchet film, you know you’re going to see some absolutely gnarly gore in the book. Artist Andrew Mangum nails some iconic shots, especially that beautifully grotesque Pez Head. And James Kuhoric’s script is extremely intelligent in his measurement of fresh material introductions. He doesn’t inundate the reader with left-field stuff, he gives us 90-percent of what we know, and a really, really compelling 10-percent of what we don’t. It’s a great pairing that only makes me want more. Knowing that the next issue isn’t due until October hurts the heart. Whether you’re into the film franchise or not, Victor Crowley is definitely at home on page. The genre passion that both Kuhoric and Mangum display is admirable and deeply, deeply appreciated. These guys are great, just as Adam Green and his throwback creation, Victor Crowley are. Must-own material!